I recently had the opportunity to do a tasty treat test. 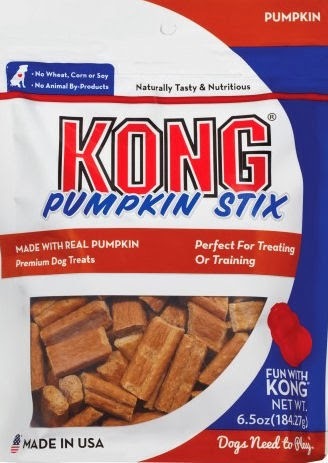 I truly enjoy Kong Pumpkin Stix. and all of Kong treats. I am like a little kid that had too much sugar. and take all my 187 toys out of my toy box. We do buy these treats and will buy them again, however. Me the Reilly dog loved these...they were soooo good but for some reason they made the dweeb barf every time he tried them...but then again - he is the dweeb.........enough said. Enjoy Lily. Have a fabulous Friday. Those treats look pawsome. Are they the soft kind or the hard ones. I guess it doesn't matter -- they still look pawsome anyway. Kelly and Ike love their stuffed Kongs, and this looks great for stuffing. I hope you are having a great day Lily! If you say they're yummy, then they've got to be, Lily! We're telling our mom that we need to have them! Those sound like good stuffs. Sometimes I take half my toys out of the box and scatter them. Maybe these treats will help me take all my toys out! BOL! Sounds like you're channeling your inner-Waffles. These sound like something that Hunter would love-of course he loves all treats more than kibble or dog food(can you tell he is spoiled?). Thanks for sharing your thoughts of these, we will try to find them. Those sound yummy and Mommy says Tuiren could use an energy boost. She is a lazy girl. But we thinks we better hide them when Mr. Who comes to visit. He is very energetic without any help. Kong has pumpkin flavor?!? I had no idea and I love pumpkin! They look super yummy. Wow, do dogs really like those? they sound yummy, but not sure if my pups would embrace them. I guess with all that sugar you can't really go wrong. Thanks for your Christmas card - it arrived today - we love it. Lily, I know that if you say they are good treats- then they really are! Those sound yummy. I think my mom would like em. Gosh those even sound good to ME and I'm a CAT! We love Kong treats but haven't tried the pumpkin. We'll have to send mama out to get some for us! PS ... thanks for the Christmas Card! We love you, Lily!!! We just had a review/give-away for those and they are DELICIOUS!! They look good, there isn't anything like that where we live.